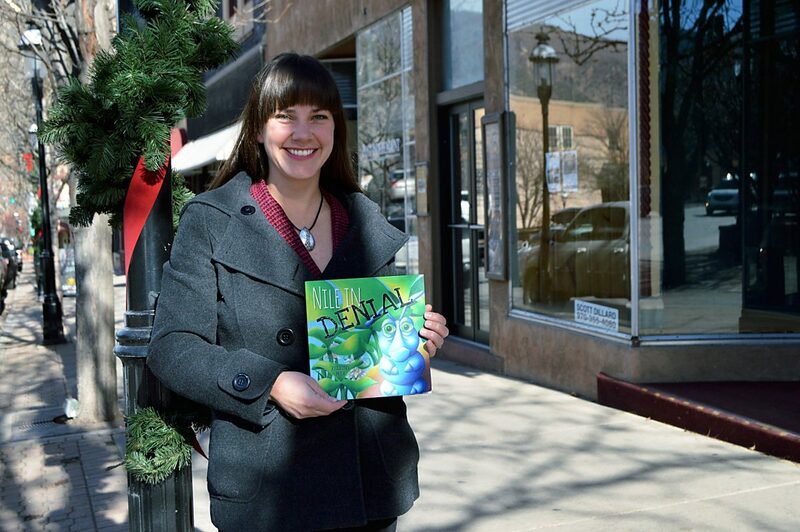 Local author and artist Jessica Meath is celebrating the release of her first children's book, "Nile in Denial," with a book signing from 2 to 5 p.m. on Saturday at the Main Street Gallery in Glenwood Springs. Local author and artist Jessica Meath, who has lived in the valley for 15 years, has always been fascinated with children’s books. Now, she’s written and illustrated her own: “Nile in Denial,” a playful story about a caterpillar who hates change and dreads his metamorphosis. Meath, who has a degree in art education with a minor in graphic design, will be at the Main Street Gallery in Glenwood Springs from 2-5 p.m. on Saturday for a book release party and signing. Attendees can purchase signed books and prints, and children will be able to participate in a coloring contest that could win them a copy of “Nile in Denial,” a custom bookmark and a set of book plates. “Nile in Denial” is also available through Amazon, Barnes & Noble, Ingram Content Group, nilethebutterfly.com and Book Train. Meath said she’s contacting other local businesses to see if they’ll stock the book, too. Meath sat down with the Post Independent to discuss her love for children’s books, the process for creating her first one and whether any more are in the works. Post Independent: What made you decide to write a children’s book? PI: What is the book about, and what lessons can kids learn from it? JM: ‘Nile in Denial’ is about a caterpillar who does not like change. He likes everything exactly the way it is; he’s very stubborn. So the whole concept of metamorphosis is not something he’s very into. He meets another caterpillar, Harvey, who’s very adventurous, and who’s all about change and experiencing something different, which Nile is not happy to hear at all. Throughout the book, Nile goes through these transitions, and he’s just grumpy about it. It goes through how he learns to acknowledge and accept change and how he grows to appreciate the benefits of it in the long run. I think it relates to all of life. PI: What was the process like for completing the book? JM: It’s been an interesting learning curve. I was actually surprised at how easily the story just kind of flowed. I sat down, and a lot of it just came out, and it seemed very natural. The hard process was going back and then refining and learning about different vocabulary and what’s appropriate for different age ranges. PI: Do you think you’ll write more children’s books in the future? JM: I hope so. I do have some ideas. I think right now I’m just seeing how this goes, and then I can kind of refocus and see how I want to pursue those other thoughts.